(Pig Exploitation - Slaughter - 29) After the horrific, debilitating loading of the pigs into dump trucks (see Pig-Slaughter-28), they were taken to mass graves where they were covered in caustic chemicals before being buried. Media reports tell of the pigs screaming at the pain of the chemicals for half hour or more before they are dead. 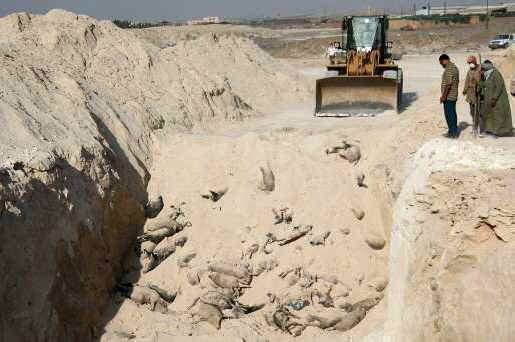 This is the intended fate of all of Egypt’s 300,000 pigs. And in case you might be wondering...in the United States, hundreds of thousands of pigs are killed each and every hour to be turned into bacon or ribs or chops. Go Vegan!